Thrive Ultimatum Review – Ultimate Countdown Timers! >> Thrive Ultimatum Review – Ultimate Countdown Timers! 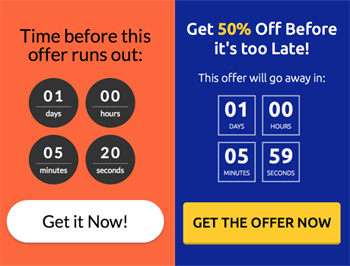 Thrive Ultimatum is the latest product from Thrive Themes, a scarcity marketing plugin. It is a multiple campaign creator featuring beautifully designed countdown timers for WordPress. 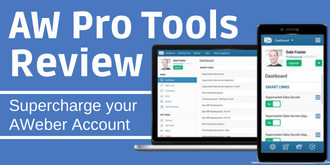 Today in my Thrive Ultimatum Review, I'll show you the versatility of the plugin and how it can benefit your business whether you are a digital product seller, e-commerce store owner or even an affiliate marketer. A countdown timer is one of the most effective tools as what is called a scarcity marketing, in order to boost sales by adding an urgency. Because buyers are motivated to purchase something that's offered for a limited period, particularly when they're alerted that the time is running out every second. This psychological effect - fear of missing out - helps increase the conversion rates in great deal. ​There are two types of basic countdown timer scripts. One type works with visitors' cookies or IP address.​ A typical example would be whenever someone visits your website for the first time, the timer gets triggered for a set period, say 72 hours. You offer something to a first-time visitor for discounted price during the first 72 hours period only. The problem is that anyone can reset the timer by clearing the cookies, or revisit your site from a different IP address. With increasing number of mobile device use, a countdown timer of this type no longer has its credibility. The other type works by the actual dates, for example you want to start a discount offer tomorrow, and end it after 7 days. So you set the timer to start counting down at 12:00am tomorrow and, when it reaches zero, the plugin either comes up with a message to say "sorry, the offer's now ended" or redirects your visitors to another url with a similar message. Obviously a fixed date campaign timer is only effective on people who happen to visit during that period. It still helps boost the revenue, but it's a one-off. It does not have a recurring power. There is a custom setting (Build From Scratch) and three pre-defined settings, which you can also customise. 7 day offer - can be triggered either when a user first visits your site, visits a specific page of your site, or can be used only for a group of visitors, e.g. your subscribers. 3 days before the end of the 7 day period, the state is changed to display that the offer is in its last 3 days. 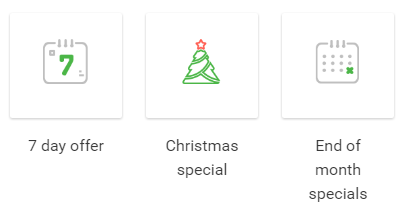 "Christmas Special" - is triggered to start and end on specific dates. When the offer has 2 days left, the state is changed to reflect the small amount of time before the offer expires. End of Month Specials - Triggered to start on a certain day of the month and to last for X days. These presets can be freely edited. 7-day offer can be changed to any number of days. For example "last 3 days" can be changed to 4 days. Extra status can also be added such as "Offer ends very soon!" on the last day. Now, Build from Scratch option provides quite a mind-boggling versatility. 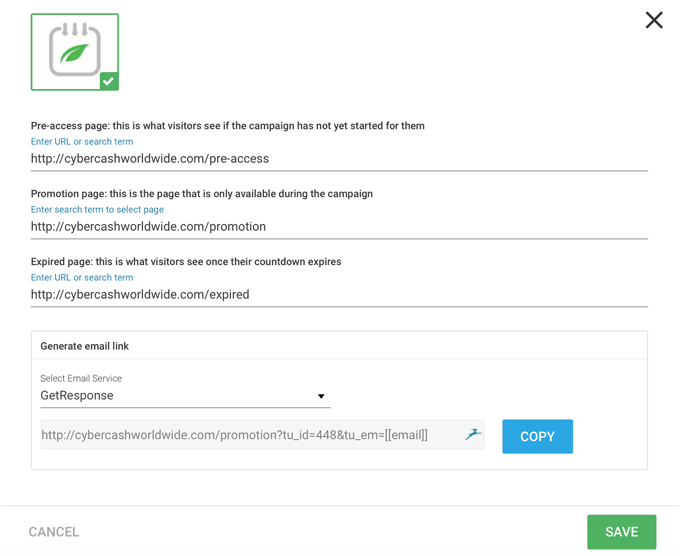 You can build either fixed dates campaign, recurring campaign or evergreen campaign from scratch. Fixed Dates Campaign is a one-off countdown which you set the start time and the end time any time of the year. 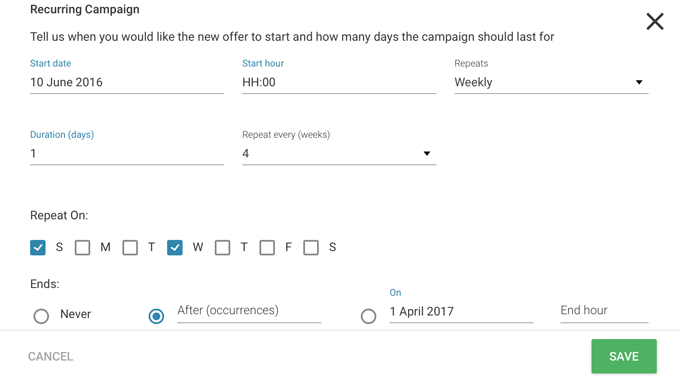 With Recurring Campaign, you can have the timer displayed in between time intervals on specific days. For example, start the timer on any date and time, run it for any duration (e.g. 2 hours starting 9am), repeat every 3 days, until specified date (or never let it end). The timer to appear on your page on Sunday and Wednesday. Duration of 1 day (=24 hours). Repeat every 4 weeks. Starting 10th June 2016 at a specified time. The campaign (timer) to appear on your page on 5th and 25th of the month - meaning it will first appear on 25th June. Duration 3 days means the timer countdown is set for 72 hours. Repeat every 2 months...ends after three occurrences. ...Which means the campaign will run on 25th June, 5th & 25th August, 5th & 25th October, and that will be the end. And of course, you can choose a yearly recurring option as well. By the way the date and time are taken from your WordPress setting. So it is important to make sure the time zone is set correctly, according to your target audience. Lastly, Evergreen Campaign. The campaign itself (e.g. discount offer) will always be active, but can only be triggered by user actions. Evergreen Campaign can be triggered in three different ways. Upon accessing a specific page (URL). 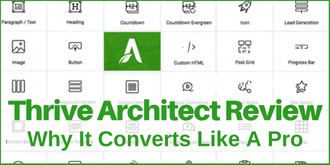 For Thrive Leads users - "Thrive Leads Conversion" automatically triggers a countdown campaign for new subscribers. If you choose "First visit to site", then anyone who visits your site for the first time will see the campaign/countdown. When they revisit your site the next day, the campaign will not appear. This is however a simple cookie based feature, so the campaign will reappear if the user clears the cookies. If you choose "Visit to a specific page", when your visitor lands on a specific page, the campaign/countdown starts to appear, and it will stay with every page they visit from then on. What I find most useful, is the following. Choose "Visit to a specific page" option, then choose "Lockdown" option. 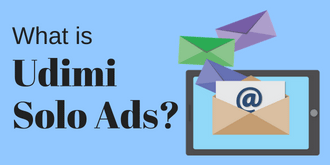 It will create a unique URL that you can email to your subscribers. Meaning it will only allow selected users to access the page, and anyone else would be restricted from accessing it. I'll show you an example below. Next you fill in the page detail like below, and select email services. 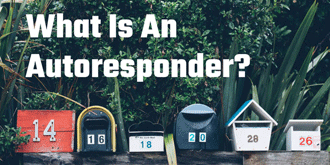 All major email service providers are listed; AWeber, GetResponse, Mailchimp, WordPress Account, Mail Poet, Ontraport, iContact, ConvertKit, ActiveCampaign, Infusionsoft, SendResach, Kilcktipp, Sendy, ArpReach, Drip, Constant Contact, MadMimi, HubSpot and SendinBlue. 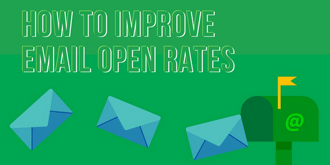 ​When your subscriber opens your email and clicks on the link, they'll land on the promotion page. If a subscriber clicks on the link after the promotional period's ended, they'll be directed to "expired" page. If a non-subscriber obtains the direct link and clicks on it, they'll be directed to the pre-access page with opt-in form. So they won't be able to get the discount, but they can opt-in to future offers. You can of course, run multiple campaigns simultaneously. Except that you cannot run two or more campaigns in the same page at the same time. This makes sense - why would you distract visitors by displaying two different countdown timers in one screen? However you can set (reserve) multiple campaigns in the same page. 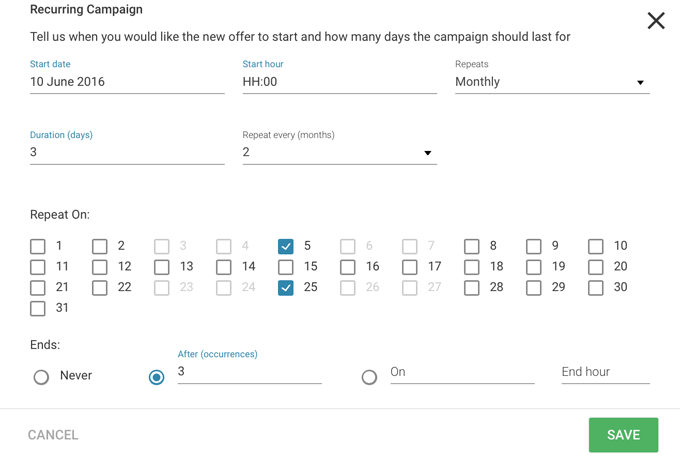 For example, set Campaign A to run from 1st - 10th July, Campaign B to run from 11th - 20th July. Just like their all other products, Thrive Ultimatum comes with stylishly designed templates for countdown timers. Needless to say, you don't need design skills to customise - it's all clicking and dragging. My recommendation is to become a Thrive member - $19 per month to receive ALL the Thrive products & new future products for unlimited use. 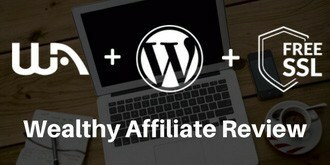 Thrive's founder Shane Melaugh always says his products are all "conversion focused" and, I do believe this new plugin for WordPress is another success. Design-wise the bold, striking look will draw anyone's attention. Fast-loading and, this plugin has not affected the speed of my site. Support team is great - I've sent so many silly questions to them, which they've responded within a few hours and kindly clarified for me. I think Thrive Ultimatum is an essential scarcity marketing tool. Once you've used it, you can't provide time-limited sales offers without it. 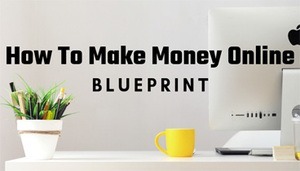 Although I think it's quite pricey for individual marketers - $127 for a single site or $197 for multiple websites. I definitely recommend you to get it while it's on 1/2 price offer. 4.5 stars - less than 5 for the normal price being a bit expensive. I can't fault anything else. Get your copy now while it's on offer!